Nepal is home to some of the most amazing and picturesque lakes in the world. Most are glacial-fed high-altitude lakes, situated at over 4000 meters. Featured here are seven amazing lakes that you should definitely consider visiting on your next trip to Nepal or Trekking in Nepal. Some are well off the beaten path; others are more easily accessible, so there will be a lake experience here to suit your plans. Situated in the shadow of world’s sixth highest mountain, Cho Oyu, are some of the most amazing high-altitude lakes of Nepal, the Gokyo Lakes. Lying at an altitude of 4700-5000 meters above sea level, the Gokyo Lakes are the world’s highest freshwater lake system, and within the Sagarmatha National Park in the Khumbu region. Formed mostly from glacial seepage, the lakes are fed from the Ngozumpa Glacier. The Gokyo Lake system comprises of numerous lakes, of which there are six prominent ones: Gokyo Cho (Dudh Pokhari), Thonak Cho (the largest), Gyazumpa Cho, Tanjung Cho, Ngozumpa Cho, and Longbanga Cho. The main lake of the system is Gokyo Cho, also known as the Dudh Pokhari (milk lake). Collectively, the lakes discharge into the Dudh Koshi river system. A walk around the Gokyo Lakes (valley) offers a picturesque view of the amazing lakes with a magnificent backdrop of mountains all around. Mount Everest hides behind other mountains, but a three-hour walk up to Gokyo Ri summit, above the lakes, reveal the majestic Mount Everest. To the right of the lakes lies the Ngozumpa Glacier, the longest in Nepal. The Gokyo lakes hold religious as well as ecological significance, and are enlisted as one of the Ramsar sites of Nepal. Tilicho Lake is one of the most spectacular lakes of Nepal. Situated at 4919 meters, it is connected with one of the world’s classic treks, the Annapurna Circuit trek. It’s as if the lake blends with the bluish skies in distance, where the two meet. The high altitude surrounding lack vegetation, thus enhancing the magnificence of the lake. Tilicho Lake, while technically not falling on the typical Annapurna Circuit trek, can be made a part of the trek. The trail to Tilicho is separated from the Manang Valley, leading westward, while the trek to the Thorang La (on the main ABC circuit) forks away to the north. Lake Tilicho falls inside the Annapurna Conservation Area and is the source of the river Marsyangdi. Also check out the Panoromic 360 view of Tilicho Lake during trekking. Phoksundo Lake, Nepal’s deepest lake, lies in Dolpa district, far to the west of Kathmandu, which can be experience during the trek to dolpo region. The freshwater lake sits at an altitude of 3615 meters. Eric Valli’s 1999 hit movie Himalaya/Caravan portrays an insightful life of people, culture and the Dolpo region as whole (and was the first Nepali movie to be nominated for a foreign film academy award). The trek to Phoksundo Lake follows an amazing trail through pristine landscapes, beautiful forest, snowcapped mountains and magnificent views. The lake itself is aesthetically pleasing. The pristine blue waters of Phoksundo sit within an alpine semi-arid landscape with patches of pine forest. Part of the Shey-Phoksundo National Park, Phoksundo Lake is a wetland with ecological importance, listed as a Ramsar site. Gosaikunda Lake is one of the most famous lakes in Nepal. At an altitude of 4380 meters in the district of Rasuwa, around 150 kilometers to the north of Kathmandu, the lake holds religious importance and is a pilgrimage site during Janai Purnima. 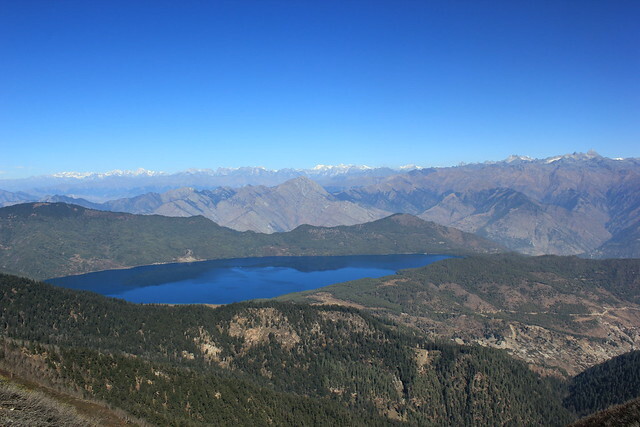 Though the lake remains frozen for only a short time during winter, the name “Frozen Lake” is often used for Gosaikunda. Enlisted as a Ramsar site, Gosaikunda is within the Langtang National Park, and can be added onto the Langtang Valley trek. It is an important wetland, and the region actually comprises over 108 lakes. A short trek of about an hour from Gosaikunda will take you to Suryakunda, Aama Kunda and other small lakes with views of Ganesh Himal and Langtang Lirung. The trail continues from there to Helambu region. Gosaikunda is the point of origin for one of the major river systems of Nepal-the Trishuli River. Far in the western reaches of Nepal sits the largest lake in Nepal, Rara Lake, at 2990 meters. Rara Lake is not as frequented as many other lakes, so offers an unspoilt environment. You will likely have an undisturbed wilderness to yourself. Rara is another important wetland of Nepal listed as a Ramsar site, within Rara National Park. The most striking thing about the lake is its ability to change to seven different colors during the light of day. This peculiar phenomenon makes it a unique lake in Nepal. The lake is so large that it takes almost a whole day to go around it. Rara Lake drains into the Mugu Karnali river. The road least travelled by takes you to the beautiful lakes of Paanch Pokhari. 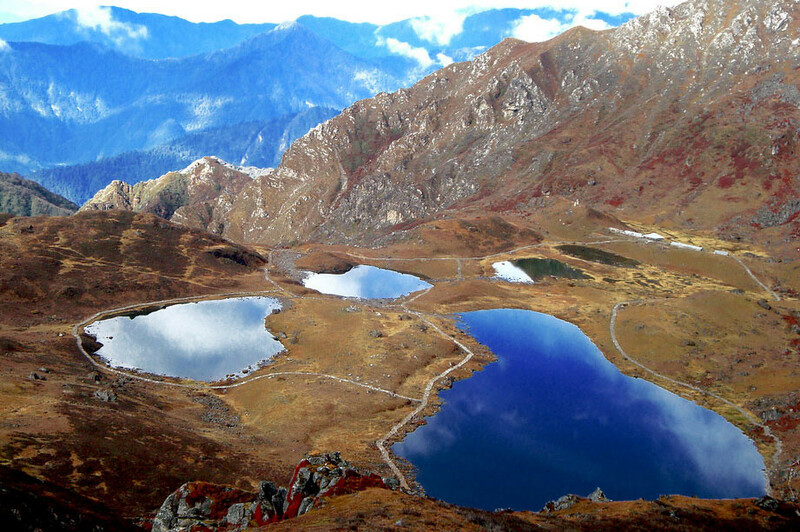 This is an alpine lake system situated at 4100 meters, in the Langtang National Park. It is definitely one of the least visited places, but still offers majestic views and an amazing trek into the wilderness of Sindupalchowk. Paanch Pokhari is also famous for its religious significance, the lake receives many visitors during the festival of Janai Purnima. But the rest of the year, the trails remain mostly undisturbed and the views of the Himalayas are also spectacular. Trekking to Paanch Pokhari requires camping trek. To the north-east of the Kathmandu Valley lies one of the biggest glacial lakes of Nepal, Tsho Rolpa. Situated at an altitude of 4580 meters, the Tsho Rolpa trek may be the most underrated in Nepal. The glacial lake lies in the Rolwaling Valley of Dolakha district. The Rolwaling region is situated between Langtang to the west and Everest to the east. The views of the Rolwaling range are particularly impressive, as Likhu Chuli rises high in front of the lake. The lake falls inside the Gaurishankhar Conservation Area, and is a very important wetland. The trek offers an insight into the lifestyle of the Tibetan-influenced Sherpa culture. If you fancy chilling out lake-side but aren’t up for a big trek at high altitude, then there are some great options in and around Pokhara. 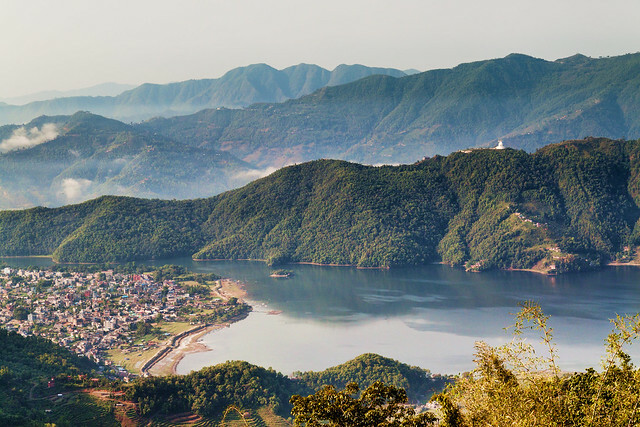 Phewa Tal is the lake around which Pokhara is built, and as well as being picturesque—with the reflections of the mountains and forests right down to water’s edge—it is a great spot to do some activities. Paddle a wooden boat, try kayaking, or even go for a swim (just make sure to go far from the shore for this last one). A short drive east of Pokhara are the lesser-visited Begnas and Rupa Lakes. They are situated just off the main highway. There are plenty of peaceful lodges to stay at around these lakes, but the overall atmosphere is untouristed and much more ‘local’ than in Pokhara. The Annapurna Himalayas form an enormous, impressive backdrop to the serene lake scenes at Begnas and Rupa lakes. The lakes of Nepal are beautiful and extremely varied—from high-altitude turquoise bodies of water surrounded in snow, to focal points of chilled-out relaxation, there is a Nepal lake experience to suit every traveller’s itinerary or interests. Remember that Nepal is much more than ancient culture and high mountains—it is sparkling blue lakes, too!